Conscious TV Interview with Renate McNay and Susanne Marie. Filmed in London, September 2018. 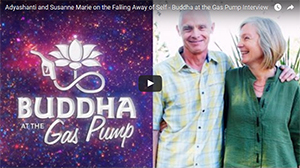 Rick Archer interviews Susanne Marie and Adyashanti on Buddha at the Gas Pump in an exploration about an often misunderstood subject. Beyond the traditional landing places that mind creates (commonly discussed in non-dual circles), lies an indescribable landscape of living as pure, direct experiencing. Prior to this opening, the habitual subjective filter creates a veil of separation of which one is not even aware. This is true even within expanded, unified states of consciousness. Once this filter falls away, life is experienced directly, as itself, without any intermediary. Conscious TV with Susanne Marie ~ Interview by Renate McNay. Rick Archer interviews Susanne Marie on Buddha at the Gas Pump. 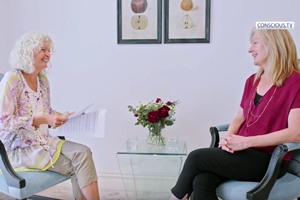 In Susanne Marie’s first interview, she describes how oneness was already known as a child, and how this awareness slowly and painfully ebbed away resulting in a seeker being born and the story of how this was eventually seen through. Buddha at the Gas Pump with Susanne Marie, Amoda Maa Jeevan, T Jonathon Proctor. Susanne Marie and Will Pye discuss the role and nature of ‘Surrender’ in awakening. Living from Love Retreat ~ Interview by Grace Bubeck. Life Challenges Series: The Essential Challenge. Vulnerability is an entry point into the heart of being. As consciousness evolves, we are given ever greater opportunities to turn towards meeting ourselves more fully. The invitation to meet oneself with love eases the transition as we make a shift from operating out of fear into one of moving from love.